Despite many efforts, we never got the latch right and I grew tired of pumping every few hours and gave up. When my third child was born, I was fiercely determined to figure out breastfeeding. This time, I was blessed with a supportive midwife who helped me with latch issues. Before giving birth, I also spoke with a wonderful lactation consultant who really did care about my ability to nurse my baby and gave me lots of information to read and offered to help me when my baby was born. She even offered to attend my birth! I was prepared. At first it was a struggle. Getting the proper latch had never been easy with other babies and Ella was no different. However, after a few long days (and nights), we got it. And that was that. I am so grateful. In preparing for that nursing relationship, I read quite a bit about breastfeeding and knew that if I wanted to be successful, I’d have to be intentional about quite a few things. Breastfeeding may be natural, but there’s still some prep work involved. This is crucial to breastfeeding properly. Without a proper latch, baby won’t get enough milk and you’ll be in a lot of pain. With my first two kids, I thought that breastfeeding was just supposed to be a painful experience. Not true. We just weren’t getting the right latch. When I finally experienced the proper latch, I breathed a huge sigh of relief. Breastfeeding went from being a chore to a pleasant experience where I could bond with my baby. I knew that I needed to nurse my baby often to ensure I had enough milk for her. At first, that meant I was feeding her all the time. As she got bigger and fell into a routine, the spaces between feedings grew. If she was having a growth spurt, she would be hungrier, so I would nurse her and my milk supply adapted to her appetite. When she started eating solids, it decreased. Breastfeeding is very much about supply and demand. I didn’t really pay much attention to what I ate after having my first two children. It wasn’t until my third pregnancy, where I switched to a midwife halfway through, that I learned that what I was eating played a major part in both my pregnancy and while breastfeeding. While I hadn’t yet learned about real food then, I now recommend new mamas eat a nourishing diet while breastfeeding with plenty of healthy fats like raw milk, whole milk yogurt, pastured eggs, etc. A galactagogue is a substance that increases milk supply. 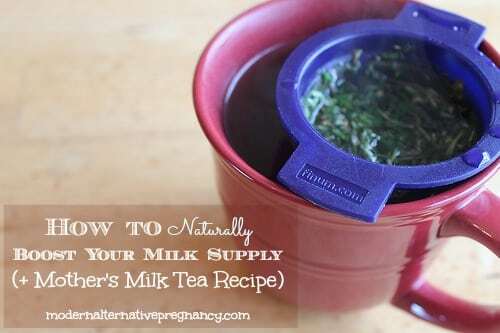 I was prepared with herbal teas that were known for their ability to help increase milk supply. My experience is with herbal galactagogues and there are plenty of safe options for increasing your milk supply naturally. Fenugreek: This was my go-to herbal galactagogue and I can vouch that it worked. Fenugreek helps increase milk supply, relieves gastrointestinal inflammation and helps with coughing. It will also make you smell like maple syrup. According to Dr. Jack Newman, it works best when taken with blessed thistle. Red Raspberry Leaf: Nutrient-rich red raspberry leaves add needed vitamins and minerals for lactation. It also works wonders on the uterus. Put all of the ingredients in a large jar, put the lid on and shake to combine. Steep 1 tsp. tea in 1 cup hot water or brew 2 oz. in one quart of water if you’d like make it in bulk. Start off with one cup of tea a day and assess after a couple of days whether you need to add another cup. Use this in conjunction with ensuring the proper latch, feeding your baby when he’s hungry and eating a nourishing diet. Do you have any tips to share about naturally boosting your milk supply? When you order the Fenugreek do you get the seed or the powder? Two words: alfalfa sprouts. I did not have trouble with milk supply, but when I ate alfalfa sprouts I was bursting with milk (it hurt). My mom grew up in wisconsin and said that alfalfa grass was the grass of choice for milk farmers, and that’s why–it increases milk production!